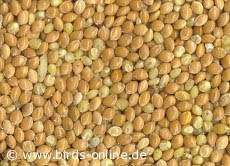 The panicum millet or proso millet (Panicum miliaceum) in its yellow form can be found as an ingredient in many common seed mixtures for small pet birds such as budgies. Panicum millet is easy to digest and contains lots of vitamins, minerals and other good stuff. And apart from this it is very common and many farmers grow this plant. Therefore these seeds are fairly cheap.